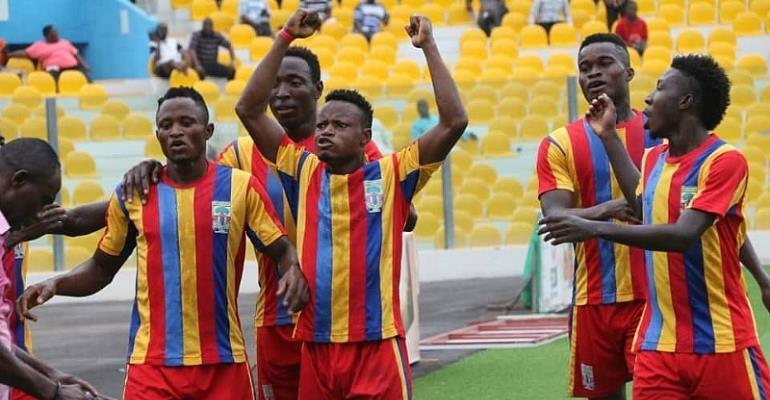 A rejuvenated Accra Hearts of Oak side put up an impressive performance to see off Dreams Fc with a 1-0 victory to start the Ghana Football Association (GFA) Normalization Committee (NC) Special Competition. In the first half, the away side started strongly as they took advantage of the Rainbow boys who could not calm their nerves. About 20 minutes into the game however, Kim Grant’s men gradually crawled their way into the match and took control whiles creating some dangerous moments in the opposition’s 18-yard box. Having managed to create some decent goal scoring chances, either team could not find the back of the net as the referee blew the whistle to end the first half of the match. Hearts started the second half with more urgency and attacked the Dawu based side right from the onset. Their efforts were finally rewarded on the 48th minute when in form Kojo Obeng Jnr opened the scoring after slotting the ball into the back of the net from just inside the area. All efforts by Dreams Fc to restore parity were thwarted by a compact and disciplined Hearts defense who were determined to keep a clean sheet at all cost. Joseph Esso on multiple occasions could have increased the scoring for the victors but goalkeeper Isaac Amoako was always alert to deny him. The three points on the day put Hearts in a good position in the Southern Zone with the NC Special Competition expected to get tougher in the coming weeks.